Normally when you think of meditation you probably don’t think about doing it in the shower. Interestingly enough, meditation can be very versatile. You can practice meditation techniques throughout the day and in most activities. 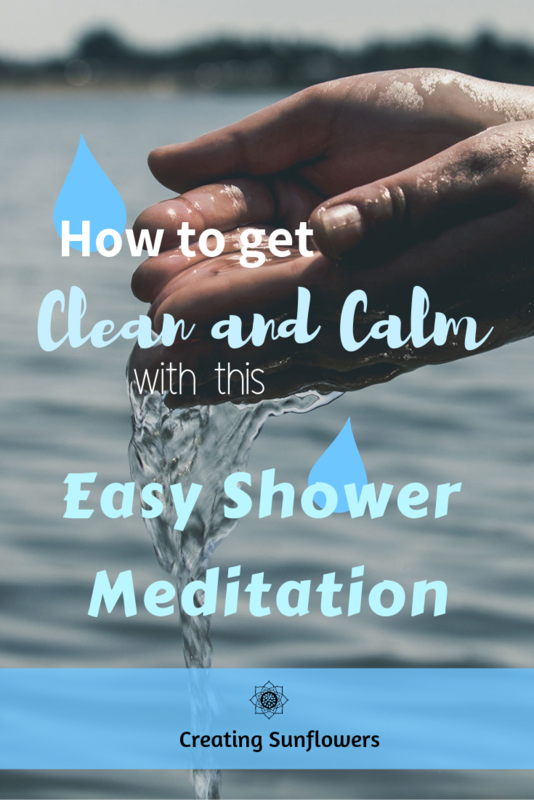 Meditation helps to calm and center the mind and this shower meditation is no different. When worries and upset builds it can sometimes be difficult to let the negative feelings go. This shower meditation is designed to help you wash away stress and discomfort through the act of visualization. There are many different types of meditation to choose from and getting started with meditation is really easy. So, let’s jump on in! Surprisingly enough this shower meditation doesn’t start in the shower. It starts in the bathroom before you’ve removed your clothes. Start by taking a deep breath and grounding into the moment. As you remove your clothes imagine yourself peeling off your outer shell. Feel into your vulnerability. Turn the water on and as you wait for it to become warm, listen to the sound it makes, feel the air around you start changing, and take another deep breath. Feel the air fill your lungs fully and on your exhale feel yourself loosen up and begin to let go. Now that the water is warm, step into it. Acknowledge the feeling of it hitting your body and washing away. From here, keeping your eyes closed can help you to focus more on the act of cleansing yourself. You don’t need to keep your eyes closed the whole time if that is uncomfortable but when you can try to close them. Feel the warm water wash over you and imagine it softening your entire body. Begin to wet your hair, feeling the water now running down the length of your body. As you continue to shampoo and condition your hair, imagine yourself washing all your thoughts and letting them run down the drain and out of your mind. With your mind empty and your hair clean grab your body wash or soap to begin cleansing your body. Take another deep breath and notice the smell of the soap in your hand. Starting with your face and neck, gently wash. Imagine that every time you touch your body to the soap that some of your stresses wash away. Continuing down your shoulders and arms, all while letting go of any emotions or worries that arise. Let the soap act as a buffer between you and your negative thoughts. Move down your torso and back and take note of your posture, finding a place that your body feels comfortable. A lot of people hold stress in their back and not only can you help that by visualizing the stress wash away but the hot or warm water can help muscle recovery. Again move further down your body to your hips and legs, all the while letting the stresses you wash out continue to run down the drain. Finish the cleanse by soaping all the way down to your toes. Think about the soap pushing out any last worries, before stepping directly under the water again. Let the water run down your body one last time. Visualize a white light radiating out from your head. Feel the water as it spreads the light down to the rest of your body, illuminating you. Feel the light shining through the now clean window of your mind. Hold onto the feeling before taking three deep and long breaths. Now you can turn off the shower and get out. Once you step out to take a moment to notice how you feel. This kind of meditation can be really good if you have a busy schedule and feel like you can’t fit anything else in, or you are just looking to find more moments in which that you can be mindful. Regardless of your situation, stresses seem to be everywhere and sometimes letting go of them can be hard. Are you looking for a great way to make everyday awesome? My free checklist for success every day can help you do just that! Ps. Meditation might just be on the list, sign up now to receive my checklist to your inbox today! Have you tried more unconventional methods of meditation like this? Leave me a comment telling me how your meditation went! Even for a seasoned meditator, there can be so many different options that making a decision can be complicated. Here we run down some of the more common types of meditations that you might come across while trying to narrow down your preferred meditation style. Meditation shouldn’t be complicated and it should be easy to find what works best for you. Focusing in on the present moment is the biggest part of mindfulness meditation. When we take time to become aware of all that is happening around us, whether in a meditation practice or not, we begin to view our world differently. Mindfulness teaches us to live more fully in the present moment. When we are not worrying about the past or the future we are able to embrace the things directly around us. The key component to mindfulness meditation is to exist in a space where the only thing to focus on is your breath. By relaxing into a practice where outside influences are let go of, we can begin to structure time outside of practice where the present moment is welcomed with non-judgment. As humans, we have the ability to set and make goals. Our minds are the most powerful catalysts for change. When we take time to set and make plans, it's truly amazing how we can then make it happen. Visualization meditation is all about our imagination and where it can take us. By setting out time in our day to visualize our plans and goals we increase the chance of making it happen. When meditating with the goal of creating change, we focus on an area of our lives that we want to inspire change in. Pick an objective and visualize how you will get there and how your life will change in the process. Visualization meditation is all about using our mind to make the changes necessary to achieve our aspirations. Movement meditation is very similar to mindfulness meditation in that its biggest component is to become aware of the present moment. This type of meditation can be practiced with many different kinds of movement, from walking, to yoga, to Tai Chi. By connecting with the body and mind we can create a sense of calmness. In any type of moving meditation, a focus is put on the connection of the mind with the body. When taking a walk, for example, an emphasis is put on the ground under your feet, any smells there might be, and most importantly the present moment. The act of showing compassion for oneself and others is the biggest part of practicing loving-kindness meditation. This kind if meditation could be considered the closest to that of religious prayer. By repeating a series of mantras we can send well wishes to the people around us. Sometimes showing compassion for others can be hard, this form of meditation helps us to practice showing love and care. Now it may seem like loving-kindness meditation is only for showing love to others but it can be extremely helpful in bringing care for ourselves as well. We can use this meditation practice to send love to anyone who we believe may need it, this sometimes being ourselves. Practicing love and kindness can make us more caring being for all those around us. The everyday world can be full of anxiety and inconveniences; transcendental meditation is designed to lift you away from these. Transcendental meditation is about reaching a state of deep relaxation, typically deeper than deep sleep. In transcendental meditation, a short mantra(typically just a vibrational sound that has no specific meaning) is repeated over and over for an allotted amount of time. A sense of calm is created when the mind and body begin to relax. Worries and thoughts are released and forgotten about. Transcendental meditation is useful in that we are lifted away from our anxieties. By repeating a mantra or a series of phrases we can work to calm the mind and elicit positive responses. We can sit in silence and say to ourselves sentences like, “I am happy” or “I am loved” to create a response. Our brains can hear our mantra and create that outcome. When we say that we are happy our brain makes it come true. A mantra can be created for almost anything we wish to feel. This mantra can be repeated not only during meditation but also outside of it. By making it a habit for our brains to hear our mantra and believe it we can “trick” ourselves into feeling any certain way. A guided meditation could be any of the previous meditation methods just with a track or someone giving you instructions throughout your practice. Having a guide while meditating can be very helpful for not only beginners as it helps to keep your focus and attention. Guided meditations can be found on apps like Calm or can be found by a simple search on Youtube. There are guides for all different types of meditations. Regardless of the type of meditation you choose to practice, there are some very beneficial things you can gain from each one. Meditation has been shown to improve focus, reduce stress, and increase happiness, along with many more benefits. Grab your cushion, your mind, and some time and start meditating today! Which type of meditation do you want to try? Have you already tried any on this list? Tell us below! For most people the act of sitting down and doing nothing may seem strange or bizarre. We live in a world where it is the norm to be constantly busy. Taking a break can be daunting when there seems to be a list a mile long of to-do’s. With so many distractions and events constantly happening around us, we begin to lose focus on the present moment. Meditation is the act of calming the mind and pulling our focus away from all the outside distractions and instead moving it inward. Most meditations are built on coming back to the breath and honing into its flow throughout the body. Maybe at this point your thinking meditation must be super easy. Sitting in silence? I don’t know how that would be hard. You may be surprised to hear that meditation in fact can actually be more difficult than most people think. We live our lives constantly thinking, only turning our mind off when it's time to sleep. Settling into a space where you need to acknowledge and let go of your thoughts can be a struggle. Some days will be easier and letting go will seemingly come naturally but other days may feel hard and as if your mind is a roller coaster twisting and turning from one thought to the next. Don’t let yourself label your practice as good or bad, instead use each one as a learning experience. Don’t overthink meditation(sometimes this is easier said than done). The most important part of meditation is the practice of it. By setting aside a specific time and place for it, it becomes more of a habit or expectation. There are no rules to when or where you should meditate; choose what works best for you. It can be helpful to use meditation to start the day fresh and without worry by practicing in the morning. It can also however be useful in aiding in sleep by doing it before bed. It is not necessary to practice at either time, just whatever works best for you. Along with scheduling a time for meditation, it can also be helpful to create a space for the practice. Maybe a fun colored meditation cushion can help to motivate you to practice. You are in control when it comes to your practice so make sure that you are comfortable and happy with your set up. Where ever you decide to make your designated spot, make sure it is free from distractions and decently quiet. Once you have everything set up to start your practice it's time to find the best or most interesting technique to you. There are many different kinds to choose from but today we will be picking one of the simplest. Mindfulness. This method doesn’t require any bells or whistles. You don’t need anything fancy but a timer and your focus. When you’re just getting started you don’t need to become a monk and meditate for hours. Start with a simple 10 minute session. You can add more time if you feel as though that that’s in your practice. Set your timer and sit or lay down in a comfortable position. Feel your muscles relax and close your eyes. Take a few deep breaths, feeling each one fill your lungs, and settle in. Relax your breath to a normal rhythm and notice where you feel it most strongly. It could be in your stomach, chest, or maybe even the cool air drawing in at your nostrils. Where ever you feel it most strongly keep your focus there. Your mind will wander but the key piece to meditation is in the repeated act of returning to your breath no matter what or how many times you get pulled away. If you need an extra piece to help hold your focus you can count “one” on the in breath and “two” on the out breath, feeling each breath from start to finish. Each time you catch your mind wandering acknowledge it, let it go, and flow back into the breath. Keep returning to the breath until the timer buzzes. When the time is up slowly come back to your body by wiggling your fingers and toes, giving your body a stretch and opening your eyes. Take a moment to note how you feel. Did this practice bring stillness? Do you feel relaxed? Or at peace? Meditation is a practice and not something that anyone can do perfectly. What to some might be seen as doing nothing, meditation can bring more calmness and focus to everyday life. By implementing a regular time for meditation real change and effects can be observed. Many people report being happier, having more concentration, and overall feeling calmer with a meditation practice. Have you ever tried meditation? What’s your experience like? What tools do you use to keep yourself motivated to meditate? Tell me below, I’d love to hear your thoughts!